COLE, William Purington, Jr., a Representative from Maryland; born in Towson, Baltimore County, Md., May 11, 1889; attended the public schools; was graduated as a civil engineer from Maryland Agricultural College (now University of Maryland) in 1910; studied law at the University of Maryland at Baltimore; was admitted to the bar in 1912 and commenced practice the same year; commissioned as first lieutenant November 1917 and was assigned to the Three Hundred and Sixteenth Regiment of Infantry, Seventy-ninth Division, Camp Meade, Md. ; served overseas; resumed the practice of law in 1919 at Towson, Md. ; elected as a Democrat to the Seventieth Congress (March 4, 1927-March 3, 1929); unsuccessful candidate for reelection in 1928 to the Seventy-first Congress; resumed the practice of law in Towson Md. 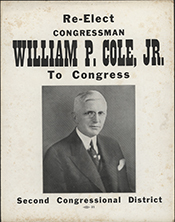 ; again elected to the Seventy-second and to the five succeeding Congresses and served from March 4, 1931, until his resignation on October 26, 1942, to become a judge of the United States customs court, in which capacity he served until 1952; member of the Board of Regents of the Smithsonian Institution 1940-1943; named a member of the Board of Regents of the University of Maryland in 1931 and became chairman of the board in 1944; appointed judge of the United States Court of Customs and Patent Appeals by President Truman July 10, 1952, and served until his death in Baltimore, Md., September 22, 1957; interment in Arlington National Cemetery.